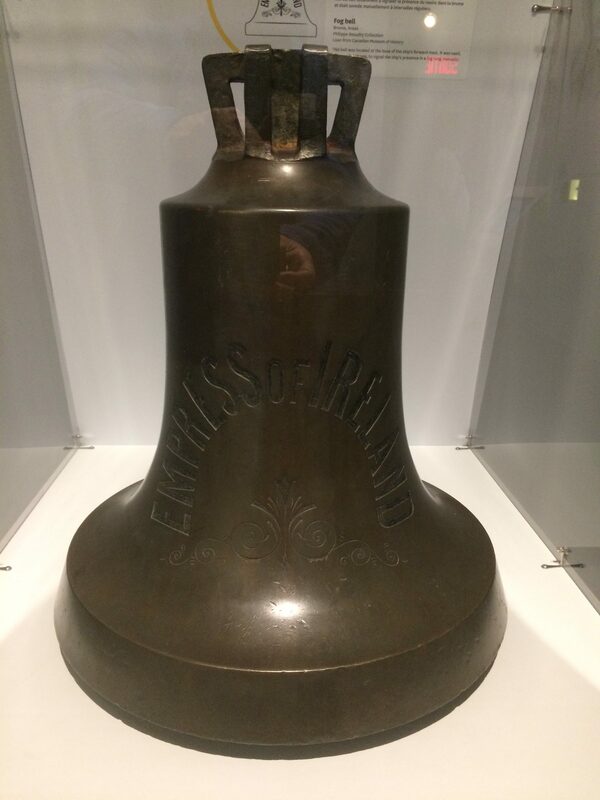 We first became aware of the tragedy of the Empress of Ireland last year at the Pier 21 museum in Halifax where several of her artifacts are on display. There, we learned that her sinking resulted in the greatest loss of life of any Canadian maritime accident in peacetime. Now, working our way up the St. Lawrence, we had occasion to study her fate further. Between Matane and Rimouski, we detoured three nautical miles toward the center of the river to find an aid to navigation “Eire” marking the spot where the Empress went down. 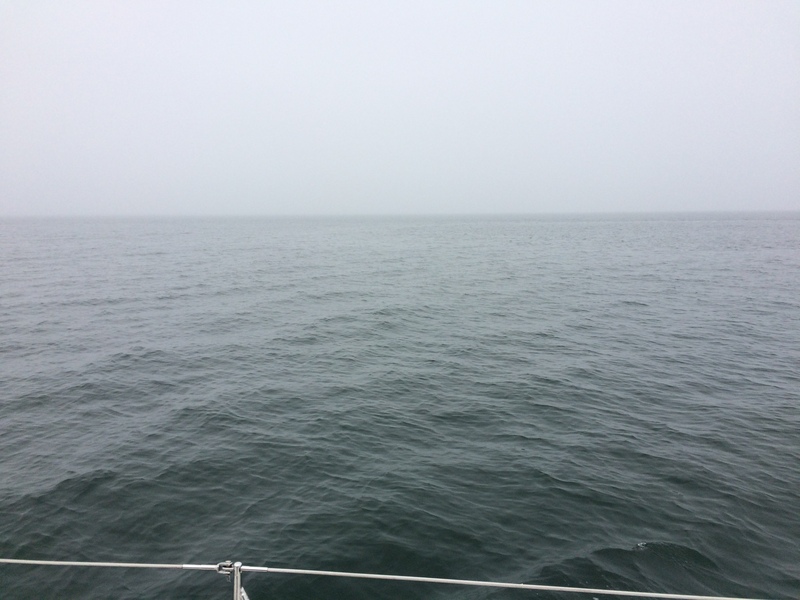 Fittingly, we were enveloped in fog as we steamed toward the mark. 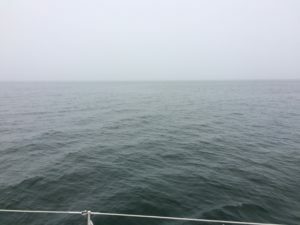 Reaching the spot, we were perplexed when we found no marker, but none-the-less observed the fog shrouded water’s surface. A seal appeared as if to confirm that we had arrived. We circled the area before proceeding on to the Rimouski marina. Our greeting there included directions to the Empress of Ireland museum 12 kilometers east. Bicycles could be borrowed to follow a paved bike path along the water to the museum. We resolved to spend the next morning visiting the museum. Until now, the current on the St. Lawrence has been always against us, at times more so than others, but always against us. Now, as we proceed upriver from Rimouski, the tidal effects change, and the current flows upriver toward Quebec City as the tides flood and downriver on the ebb. From here, it’s important to get the timing right to take advantage of a helpful current and avoid a hurtful one. There’s a thing in this business that’s priceless. It’s called “local knowledge.” I needed it now to help me interpret the tidal atlases and tables I had bought on the internet in Denver to guide us up this stretch of the St. Lawrence. So the first order of business in the morning, before we could head out for the museum, was to get local knowledge. 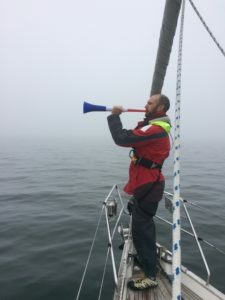 Not one to be shy, I approached a friendly neighbor on a nice looking yacht a few slips down from Windleblo and asked him if he had made the passage to Tadoussac, our next port of call 30 nautical miles across the river to the north. As we talked, he introduced himself as Claude and dug out a tidal atlas from his hold. It was the very same one I had brought from Denver! He called it the bible and was happy to give me a quick lesson on how to use it. My confidence in planning our onward passage soared. Before we closed, Claude asked about our voyage thus far and our plans for our time in Rimouski. We shared our story and told him we wanted to visit the Empress of Ireland museum to further our education about things Canadian. When he heard we were planning to bicycle there, he offered us the use of his car for the excursion. We tried to refuse but he wouldn’t hear it. With his wife and two friends, they planned to be out on the water for several hours and wouldn’t need the car. We relented and took his keys. It seems Canadian largesse isn’t limited to the Maritime Provinces after all. At the museum, we learned all about the tragedy, first viewing a stimulating introductory video, then browsing a well done series of exhibits complete with many displays of artifacts salvaged from the wreck. From Wikipedia: “Empress of Ireland departed Quebec City for Liverpool at 16:30 local time (EST) on 28 May 1914 with 1,477 passengers and crew. Henry George Kendall had just been promoted to her captain at the beginning of the month, and it was his first trip down the St. Lawrence River in command of her. “The ship reached Pointe-au-Père, Quebec (or Father Point) near the town of Rimouski in the early hours of 29 May 1914, where the pilot disembarked. Empress of Ireland resumed a normal outward bound course of about N76E, and soon sighted the masthead lights of Storstad, a Norwegian collier, on her starboard bow at a distance of several miles. Likewise, Storstad, which was abreast of Métis Point and on a course W. by S., sighted Empress of Ireland‘s masthead lights. The first sightings were made in clear weather conditions, but fog soon enveloped the ships. The ships resorted to repeated use of their fog whistles. At about 02:00 local time Storstad crashed into Empress of Ireland‘s starboard side at around midships. Storstad remained afloat, but Empress of Ireland was severely damaged. A gaping hole in her side caused the lower decks to flood at an alarming rate to the crew. “Empress of Ireland listed rapidly to starboard. There was no time to shut the watertight doors. Most of the passengers and crew in the lower decks drowned quickly; water entered through open portholes, some only a few feet above the water line, and inundated passageways and cabins. Those berthed in the upper decks were awakened by the collision, and immediately boarded lifeboats on the boat deck. Within a few minutes of the collision, the list was so severe that the port lifeboats could not be launched. Some passengers attempted to do so but the lifeboats just crashed into the side of the ship, spilling their occupants into the frigid water. Five starboard lifeboats were launched successfully, while a sixth capsized during lowering. An engine room worker, William Clark, survived the sinking. He had also worked as an engine room worker on the fateful voyage of the Titanic two years earlier, which he also survived. While the sinking of the Titanic dominated the news for months after its occurrence and has long continued as a public fascination, the sinking of the Empress faded quickly into obscurity primarily because headlines within weeks of her sinking were dominated by the outbreak of World War I. The captain of the Empress, George Kendall, survived the sinking and went on to command World War I warships, one of which was torpedoed and sunk. He survived. An investigation into the Empress tragedy did not assign blame, saying the fog was the primary culprit. The Empress of Ireland tragedy provided impetus for subsequent conventions leading to adoption of the International Regulations for Avoidance of Collisions at Sea, a.k.a., the ColRegs. Our history lesson complete, we were ready to cross over to the north shore of the St. Lawrence.